You are invited to explore Myanmar. This land, scattered with gilded pagodas where the traditional ways of Asia endure, was previously off-limits and has now opened up. Myanmar is not yet jaded by tourism, tourists remain a novelty in Burma, the Burmese are some of the friendliest people you will meet and encounters with locals are a highlight of a trip. There is no better time to visit Myanmar than now so let the epic journey start! Accommodation will be based on a superior room type. Higher room grade can be arranged subject to availability and additional charge and you are advised that in some cases your selected hotels are fully booked, you will be offered alternative accommodation in a hotel of an equal category. Fly to Yangon. Upon arrival at Yangon International Airport (RGN), you will be welcomed by the local guide and transfer to your hotel. The rest of the time is at your own leisure. You will stay overnight in Yangon. Breakfast is at the hotel. Yangon, being the first stop for your tours, has a lot to offer you in a city tour. On this day, you will visit Yangon's colonial-style city center, Mahabandoola Park and town hall. In the afternoon, you will find all the souvenirs on your list at bustling Bogyoke Market (formerly Scott’s), which is closed on Monday. You will end the way with a visit to historic Shwedagon Pagoda one of the wonders of the world, towering almost 100 meters above the cityscape, believed to have been built over 2,500 years ago. You will drive back to the hotel with a lovely sunset. After early breakfast at the hotel, you will transfer to the airport for your flight to Bagan. 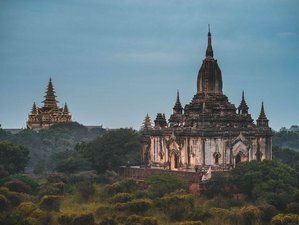 Upon your arrival, start your Bagan tour with a visit to the vibrant Nyaung U Market, unveil the glory of Bagan's history by visits to archeological treasures such as the Shwezigon Pagoda for its impressive bell-shaped stupa, Dhaman Yan Gyi and graceful Htilominlo Temple with its delicate plaster carvings and glazed sandstone decorations. Continue to the golden stupa of Shwezigon Pagoda for an introduction into Bagan’s rich history. Then to discover the ancient and most treasured handicrafts of lacquering by a demonstration from the skilled artisan. Explore the amazing mural paintings under the protection of UNESCO at Myingaba Gu Byaukgyi Temple. Evening travel by horse cart for a tour passing along ancient temples. Enjoy an unforgettable sunset over the plains from the upper terrace of one of the temples. Overnight in Bagan. Breakfast is at the hotel. You will depart towards Mount Popa, an extinct volcano at 1,520 meters above sea level, it becomes the sanctuary of the spirits "of the Nats". After climbing the 777 steps leading to the summit, you can reach the Taung Kalat Monastery perched on a rock outcrop. On the way back to Bagan, along the way, you will stop in a local village where the people use the fruit of the palm tree to make wine and molasses. Witness the incredible production process and enjoy the palm juice. You will then return to Bagan where you will stay overnight. After early breakfast at the hotel, you will transfer to the airport for your flight to Mandalay. Upon arrival, cross the mighty Ayeyarwaddy River, visit around Mingun, home to huge and famous unfinished pagoda. You will also visit the Hsinbyume Pagoda and the largest ringing bell in the world, Mingun Bell. You will go back to Mandalay after and will have some time to rest at the hotel. In the afternoon, you will visit the Mahamuni Pagoda, one of the country's most revered Buddha images which, over the years, has been covered with gold leaf for hundreds of layers. After that, you will visit the marble carving workshop and gold leaf beating workshop. Then you will visit the Shwe Nan Daw Monastery, Ku Tho Daw Pagoda, and enjoy the sunset at Mandalay Hill. You will spend overnight in Mandalay. Breakfast is at the hotel. You will visit the Mahagandayon Monastery. It is 11 kilometers from Mandalay, in the former Burmese capital of Amarapura. Around 10 in the morning, over 1,000 monks who live in the monastery come out to receive food from donors. Everything is planned, the monks are standing in two rows, volunteers distribute the food, the dining rooms are filled and they eat at the same time. You will drive to the former capitals of Amarapura. Proceed to Ava or Inwa, the capital from 14th to 18th centuries and visit by horse and carriage the old wooden Bagaya Monastery and the remains of the Royal Palace and fort, the Maha Aungmye Bonzan, and Htihlaing Shin Paya. In the afternoon, you will cross the bridge over the Irrawaddy River and continue to Sagaing. Covered with 600 white-painted pagodas and monasteries, Sagaing Hill is widely regarded as the religious center of Myanmar and is home to 3,000 monks and 100 meditation centers. In the evening, you will visit the U Pain Bridge, the whole bridge is done with the entire wood and take the sunset boat over the Taingtaman Lake. You will stay overnight in Mandalay. Breakfast is at the hotel. Then you will be transferred to the airport for flight to Heho. Upon arrival, you will drive to Nyaung Shwe, the gateway to Inle Lake. Observe the leg-rowing fishermen and see their floating gardens built up from strips of water hyacinth and mud and anchored to the bottom with bamboo poles. Visit Nga Hpe Chaung Monastery, which houses dozens of Shan Buddha images. Continue to Phaung Daw Oo Pagoda, the lake's main sanctuary, which contains five sacred Buddha images covered in gold leaf. Explore the local crafts of Inle Lake with a stop at the cheroot factory, where the typical Burmese cigars are made by hand. You can also visit a local silk weaving factory which sits on stilts on the lake and where they still use old style handlooms. If time permits, there may be time to enjoy a short walk through one of the lakeside villages. You will stay overnight in Inle Lake. Breakfast is at the hotel. Continue your sightseeing to Inle Lake this day with a memorable visit to Indein village with its idyllic 17th-century pagodas. Indein is one of the small villages of the Inle Lake located on the western bank of Inle Lake. A Buddha image has enshrined at a whitewashed stupa, which is on the summit of hills. Below the stupa around the hill is a cluster of hundreds of ancient stupa mostly are ruins overgrown with bushes. The pagoda hill is quiet and calm. One could feel the pleasant cool breeze with the sweet ring of the bell hanging at the umbrella of the stupa. The mesmerizing view from the pagoda hill releases the fatigue and refreshes everybody who ascends to the peak. This mysterious place is at the end of the marvelous Indein creek, which connected with Inle Lake just after the Phaund Dw Oo Pagoda. The creek is narrow with many twist and turns. Since both sides are paddy fields, you can see the farmer plowing and harrow by water buffaloes. At many places in the creek, the farmers dam up the water by bamboo barriers to irrigate the paddy fields. Indein water is not useful irrigation also for bathing and washing clothes. It is compulsory to see novice monk, buffalo's boys and village girls washing and swimming on the creek. You will surely enjoy sightseeing in Indein. You will stay overnight at Inle Lake. Breakfast is at the hotel. You will transfer to the airport for flight to Yangon. This day, you will start to visit Kabe Aye Pagoda, it is dedicated to the peace in the world and the Maha Pasuna cave where the sixth Buddhist Synod took place in 1952. In the afternoon, you will visit Bogyoke Aung San Museum and pay a stroll along the bank of Inya Lake. You will stay overnight in Yangon. After breakfast at the hotel, you will be transferred to Yangon International Airport (RGN) for your international departure flight. This will be the end of this tour. This itinerary and schedule are subject to change due to weather, road condition, flight, type of class and operating conditions. All the above points of interest are open for a visit based on current updates. In case of closure for construction or any other reason, it will be replaced with a similar point of interest. Myanmar is a truly fascinating and spiritual country, largely unexplored by tourists. The country has reserved its culture and landscape, remaining relatively unchanged since the British colonial times, which is possibly due to the fact it was cut off from the rest of the world for many decades. The country has a diverse ethnic makeup. The population is divided into eight ethnic groups and 67 subgroups, each with their own dialect and culture. A share of 89 percent of the population is devoutly Buddhist which is reflected by their gentle and welcoming nature. The country is known as the "Golden Land" because of the countless number of pagodas and temples, which dominate the landscape. Daily breakfast will be served to you. Meals are a fusion of local Vietnam, Indian, Western, or Halal (Muslim type) foods. Please advise if you have any special food preferences, allergies, or dietary requirements at least one week prior to your arrival date. Vietnamese Private Tours offers tours of Vietnam and Indochina, which will allow you to explore the nature, history, culture, food, and beauty of these regions. The price for 4 to 9 years old children with extra bed is 75% rate of the adult price rate, while 65% for without extra bed. Children 10 years old and above pay 100% rate as the adult. Children under 3 years old are free of charge for land service only.